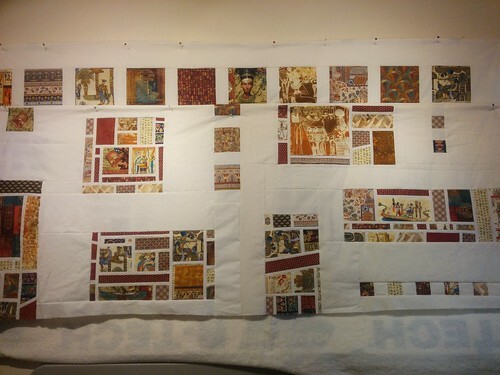 For nearly four years, the entry for this quilt said: "A placeholder. I'm working on it but haven't written it up yet. Sorry!" It's time to really write it up, and that requires some trawling of my inbox, eBay records, and archived Flickr photos. 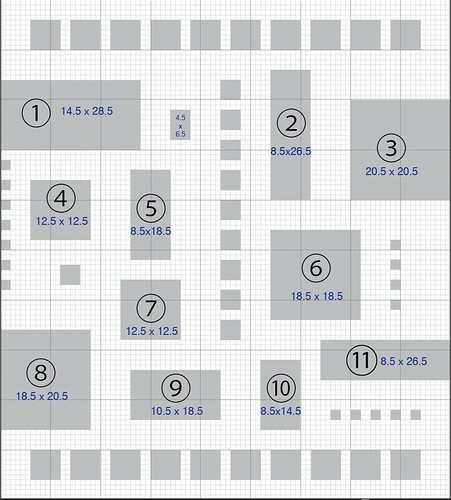 1) Scan over those fabrics I've bought. 2) Take a look at this ebay link; this seller has a few fabrics that coordinate with what I've already bought, and I have a standing order with this person I haven't paid for yet. I've requested a total, though, so I've got a little time. Sourcing the fabrics for this quilt was eye-opening for me. I'd previously held the nebulous idea that any design I wanted to do could be found in quilting fabric if I looked hard enough, and it didn't prove to be the case here. 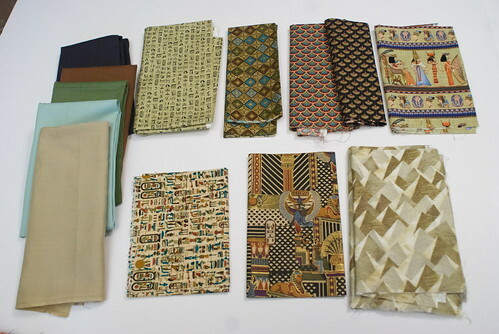 We simply couldn't find Egyptian-themed fabrics, and we didn't understand why at first. I began to realize how carefully-curated the world of quilting fabrics is; if a type of design isn't currently in vogue, it's unlikely to be available. You may think your giant fabric stores have everything, but I'd challenge you to do what we did: walk in, and look for Egyptian-themed fabrics. We'll be here when you come back empty-handed. The answer is, of course, the secondary market. Resale shops. Etsy. Ebay. Swapping with other quilters. Quilters buy fabrics they like (because they understand on an instinctual level that fabric lines go out of print, and you'd best snap up what you love while it's available) and stashed fabrics either get used or trickle out into the resale market over a number of years. Fortune favors the patient, in our case. We didn't find yardage. Instead, we began a months-long dig to find anything and everything Egyptian-themed, frequently sourcing interesting fabrics a quarter-yard at a time from individual sellers. We got savvier in our searches; sometimes it would be listed as "African," and sometimes "Egyptian." 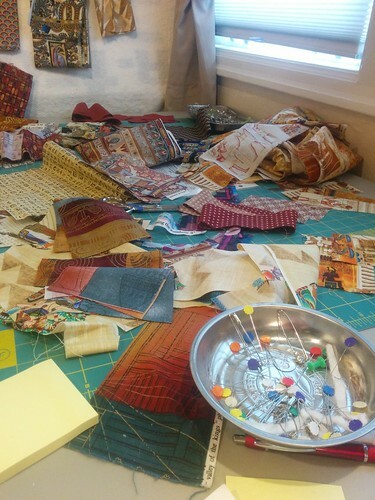 We eventually acquired enough quarter-yards to start piecing together selvages and figuring out what lines of fabric we were unknowingly attempting to reconstruct. We bought anything we loved, and trusted we could sort it out later. When I found 6 yards of suitable backing from a British eBay seller who didn't ship internationally, I arranged to have the fabric shipped to a British friend, who then re-shipped it out to me. 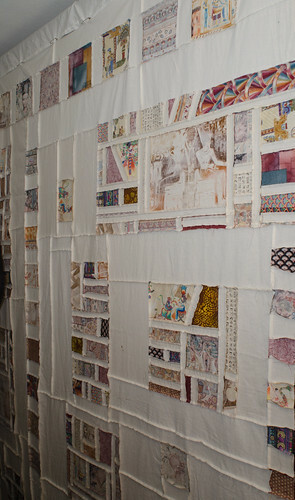 The green-toned fabrics were diverted off into a lap quilt called "Papyrus," which was finished several years ago. The red ones, however, would have to wait. That was late July of 2010. After Jeff's accident five months later, this idea was completely shelved. It went into the topmost drawer of my in-progress bin. Over time, the guilt nibbled at me: what if the tornado had hit my home instead of a half-mile down the road? 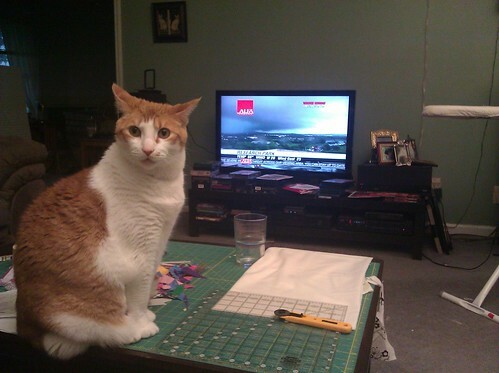 All the intention in the world didn't make a finished quilt. Only effort did, and what I had in the top drawer was nothing but plans. Time continued to pass. In order to support the changes that Jeff's accident required, I took a new job in October 2011 that allowed me to work from home, but caused me to incur a significant amount of travel. The quilt couldn't be worked on from the road, and so it continued to sit. As I packed up my sewing room in November 2013 in preparation for moving to Oregon, I found the pieces -- all carefully stowed in the top drawer -- and chose not to ship them to Jacob. I kept them with me. Surely this life in Oregon would allow this quilt to be finished. Eventually, on his third trip to visit me in Oregon in January 2015, Jacob and I agreed that it was time to knock this project out. We scheduled a week of vacation together, and made no plans except sewing. 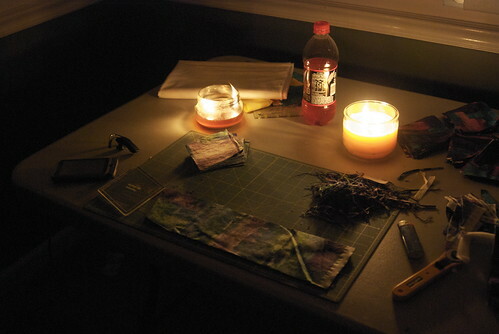 I cleaned my sewing room, and once cleaned, I emptied my top drawer onto my sewing table. I looked at what had been bought years ago, and it felt like it had come from another life: married, living in Alabama, two littermate cats. 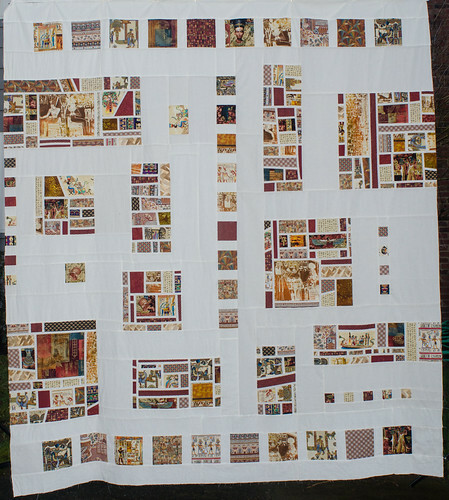 I pulled it out in my quilting studio in Oregon, a single woman who had lost both previous cats to old age and adopted two more, and then pinned up the quilt schematic. It was time to make this project right. We got to work making a right royal mess. Mosaics require large quantities of source material. In my mind, I have always classified this quilt as one of the three Tornado Quilts: three major pieces I had in progress since the April 27 tornado that came with me to Oregon, still guiltily unfinished, three years later. Jacob will be doing this quilting on this top, and my involvement ends now that the top has been pieced. The next top, Pentatonic, is approximately a week away from completion, and will be sent off to be quilted sometime within the month. The third, Seven Brides For Seven Brothers, will then become the focus of my sewing for the next few months. Dear self: have some forgiveness. 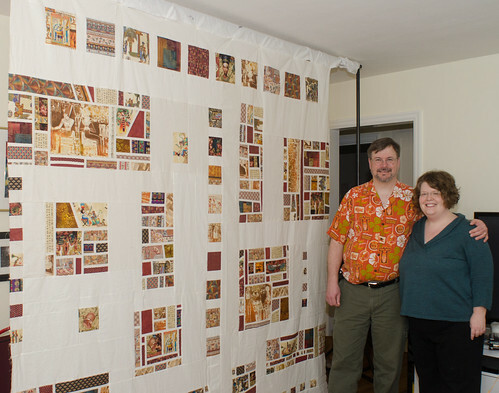 Two of the three tornado quilts will complete in 2015, and possibly all three. 2011 through 2014 weren't exactly banner years. The top drawer is already filled with another project that's been waiting in the wings. I look at the variety of fabric and find myself wondering if the Fledgling approach would work here. 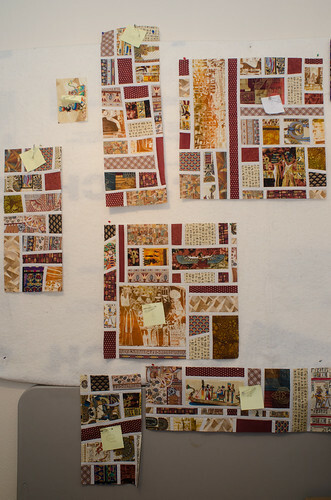 I'm revisiting this after reading about Papyrus; in the blog entry on that quilt, there is mention of the old name for this quilt, Desert Rose. Cairo Sunset came up later. 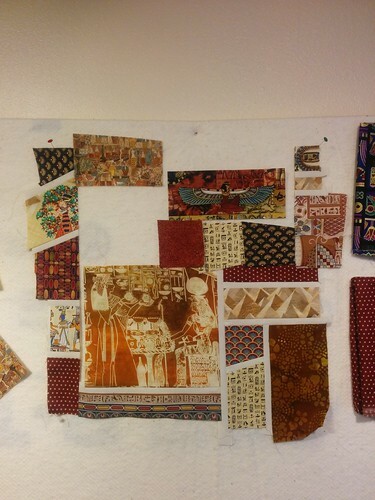 One thing I'm proud of in these fabrics: In the upper-left corner are two batiks. They were picked to provide a color match to the somewhat wild fabric to the right of the solids in the top center of the picture. That fabric has some gold printing on it, but the underlying colors are like mini-ombre patches, and trying to find a solid that worked was impossible where we were. The batiks were very very close. My earlier comments were from times when this entry only had photos of the fabrics. I want to add one thing now: Amy didn't include a picture of the overall sewing room. 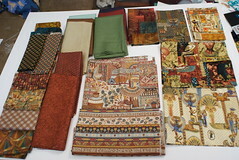 We had one table set up with piles of the fabrics and the sewing machine. We had another table set up with another cutting board and the rulers we were using. There was an ironing board and iron between them, with the design wall making the forth side of the box. I don't think we could have fit in a third person, but we had a system going pretty well.